The Personnel Armor System Ground Troops (PASGT) helmet (also known as the "Helmet, Ground Troops and Parachutists," the "K-pot" or the "Kevlar") is the standard infantry helmet. The item was originally type-classified in the late 1970s and fielded in early 1980s. 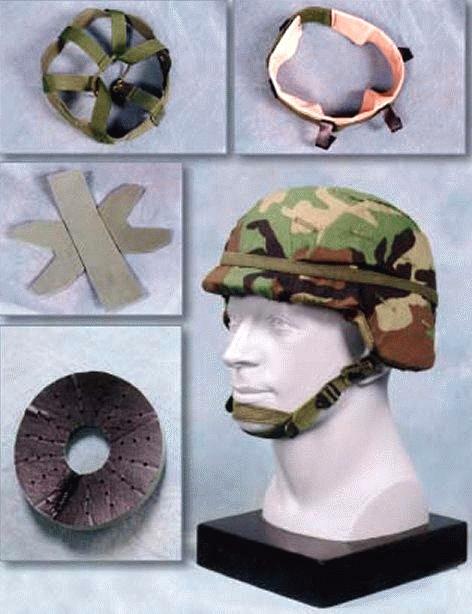 The helmet provides ballistic protection from fragmenting munitions to the head, temple, ear and neck areas. It is available in five sizes. The helmet shell is a one-piece composite structure made up of multiple levels of Kevlar® aramid fiber. The current PASGT in the field is made of Kevlar® 29 and weighs between 3.1 lbs (x-s) and 4.2 lbs (x-l). The recently type-classified version, made of Kevlar® KM2, weighs approximately 10 % less. The current chinstrap is a two point design, having an open chincup and two adjustable buckles and a single snap fastener on the left. When the wearer has a properly sized helemt, the helmets cradle-type suspension provides standoff between the head and inner helmet surface allowing for ventilation and deformation during impact. A cloth cover is available in several camouflage patterns. A band is used in conjunction with the cover. For parachutists, a pad, retention strap, and liner are available to provide impact protection and increase helmet stability during airborne operations. The PASGT helmet has undergone a multi-phase Soldier Enhancement Program (SEP). That program has type-classified several improvements to the PASGT helmet improving helmet comfort, stability, and safety. Suspension: A new suspension assembly (webbing) and headband have been type-classified, providing better stability, more comfort, and eliminating the metal clips. The suspension system and headband are 1.5 inches wide and hook/loop tape is used to attach the headband to the suspension assembly. Fielding to high-priority units will take place during the fall of 1997. Comfort Pad: The Comfort Pad is a 5-3/8 inch diameter foam pad that provides comfort in the crown area of the helmet. It attaches to the suspension webbing with a hook/loop strap. Parachutists' Impact Liner: The Parachutists' Impact Liner (PIL) is a foam pad that is slid into the helmet between the suspension webbing and helmet shell. It improves non-ballistic (bump) impact protection by approximately 25%. It is easily installed and removed in seconds. Lightweight Shell: Work in the Science and Technology area resulted in a FY98 Soldier Enhancement Program. The program will develop and test a new lightweight shell. The target is a 25 % reduction in weight when compared to the Kevlar® 29 helmet in the field. The SEP program was planned for two years with procurement of helmets in FY98. Surveys from OIF/OEF reveal that a significant number of Soldiers are not properly wearing the Personnel Armor System, Ground Troops (PASGT) Helmet or the Advanced Combat Helmet (ACH). Results of a U.S. Army Aeromedical Research Laboratory photo survey indicate that roughly half the Soldiers in the field are wearing the ground combat helmets improperly. 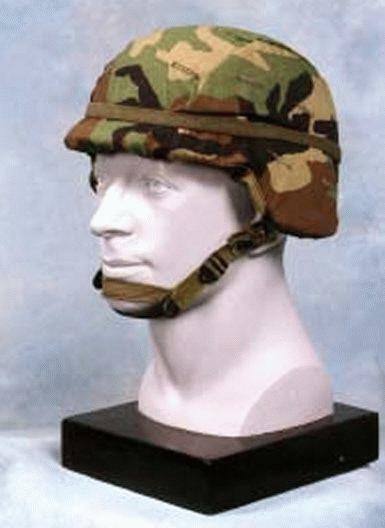 In cases where the PASGT or ACH helmets are fitted or worn improperly, the Soldier is exposed to increased risk of injury due to ballistic threats (fragmentation) or concussion. The majority of improperly sized/fitted helmets have been found to be too small. A properly fitted PASGT helmet should have a minimum ½ inch space between the head and the helmet. The helmet should not be so big that it blocks the wearer's vision or so small that ventilation, comfort, and safety suffer. A properly sized and fitted Helmet will sit level on the Soldier's head (side to side), with the lower edge of the front rim being set at the top of the eyebrow and level to the ground or slightly inclined with respect to the ground. When tightened, the chin strap of the PASGT will be centered with equal distances on each side between the chin cup and mounting location on the helmet. If the PASGT helmet sits too high or low on the head, use the adjustable drawstring tab on the suspension system to correct. Commanders can quickly inspect that the bottom of the PASGT comes to the bottom of the Soldier's ear. Failure of this inspection justifies further investigation as to the fit and wear of the PASGT. Soldiers may also find that over time the PASGT will begin to fit more loosely. The headband and suspension system may need to be adjusted to compensate. The Face Shield, Ballistic provides the Warfighter with face protection from a wide range of threats (e.g., debris, liquids, hand thrown objects, and direct/indirect fire). The shield is manufactured from acrylic and bullet resistant materials to provide Level IIIA protection (9 mm & .44 Magnum pistol rounds), weighs 3.4 lbs. (1.54 kg), and is compatible with the PASGT Helmet and M-17/M-40 protective masks.